Finally, fund distributions must comply with the consumer protection rules of Book VI of the Code of Economic Law. The regulatory framework governing Belgian asset management activities consists of the UCITS Law, the AIFMD Law and the Royal Decree of 12 November 2012 on certain public undertakings for collective investment (UCI Royal Decree). The UCITS Law implements the UCITS Directive4 in Belgium, and also introduces a framework of provisions applicable to securitisation vehicles. First, the UCITS Law contains rules applicable to Belgian UCITS5 and foreign UCITS fulfilling the conditions of the UCITS Directive whose shares are publicly offered in Belgium.6 As such, the UCITS Law is not applicable to foreign UCITS whose shares are offered within the context of a private placement. In derogation from the UCITS Directive, the UCITS Law further distinguishes between Belgian UCITS whose shares are offered within the framework of a public offering and Belgian UCITS whose shares are offered within the framework of a private placement. Publicly offered UCITS are subject to additional requirements, such as registration with the FSMA. Moreover, all communications, advertisements and other documents that are related to a public offering of the shares in a UCITS7 must be pre-approved by the FSMA, and must be complete, accurate and consistent with its prospectus. EEA management companies intending to operate in Belgium under the freedom to provide services must notify the information mentioned in Article 18 of the UCITS Directive to the competent authorities of their home Member State. Third, the UCITS Law governs the rules applicable to institutional securitisation vehicles. In accordance with Article 271/3 of the UCITS Law, securitisation vehicles are defined as 'investment undertakings with the exclusive goal of investing in receivables held by third parties, which are transferred to the investment undertaking in accordance with the provisions of the UCITS Law'. Part III-bis of the UCITS Law imposes a set of rules and obligations, including the obligation to register the securitisation vehicle on a list held by the Federal Public Service Finance and provisions relating to the required organisational form of the securitisation vehicle, and the requirement to manage the vehicle in accordance with the principle of risk spreading in the interest of the security holders. The AIFMD Law is a complete and accurate transposition of the AIFMD,10 introducing a regulatory framework for AIFs and their managers. In addition, the Belgian legislator has moved all provisions of the UCITS Law, which were applicable to AIFs whose units are publicly offered and to AIFMs of such public AIFs, to the AIFMD Law. marketing one or more Belgian AIFs for which Belgium is not the Member State of reference. Further, Part II of the AIFMD Law transposes the Directive's provisions applicable to AIFMs, and imposes obligations relating to authorisation and passporting, organisation, (risk) management and reporting onto AIFMs governed by Belgian law15 on one hand, and foreign AIFMs (both EU AIFMs16 and non-EU AIFMs17) on the other. Moreover, it provides a 'light regime' for smaller sub-threshold AIFMs,18 which are only required to register with the FSMA and are not subject to the other requirements of the AIFMD Law unless they choose to opt in. The Belgian legislator has decided not to make use of the possibility provided in the Directive to impose stricter rules on these sub-threshold AIFs unless they are publicly offered. Part III of the AIFMD Law contains the non-harmonised provisions applicable to AIFs, which originated from the UCITS Law. In this part of the AIFMD Law, a distinction is made between publicly offered AIFs,19 and non-public AIFs governed by Belgian law that have opted for the status of an institutional20 or private21 AIF.22 The obligations imposed by the AIFMD Law differ depending on whether the shares of the AIF concerned are offered within the framework of a public offer or a private placement. a requirement to distribute a number of pieces of offer documentation27 in at least one of the national Belgian languages. Qualification as a public offer also impacts the AIFM. Part IV of the AIFMD Law, which contains the non-harmonised provisions on AIFMs, imposes a list of additional obligations on AIFMs managing publicly offered AIFs. These obligations include licensing and organisational requirements. To the extent that the offering of the shares in an AIF is qualified as a private placement, no other requirements are imposed by the AIFMD Law. However, within the category of non-public AIFs, Part III of the AIFMD does provide specific provisions for institutional AIFs and private AIFs, mainly relating to the internal management of the AIF and a similar restriction of admitted investment categories. The UCI Royal Decree, which has been amended pursuant to the adoption of the AIFMD Law, provides detailed rules applicable to publicly offered Belgian undertakings for collective investment (UCIs) relating to the licensing requirements, the key investor information document (KIID), advertisements, master-feeder constructions and periodic reporting requirements. Moreover, the UCI Royal Decree also contains provisions applicable to UCIs governed by the law of an EEA Member State. The Belgian market traditionally is an open market, with mostly foreign UCITS and AIFs being marketed to Belgian retail and professional investors. Those funds can be either open-ended or closed-ended. The state also intends to promote investments in non-listed and young, growing companies, which often experience difficulties in obtaining finance while representing a significant economic potential. A Royal Decree relating to AIFs investing in such companies was adopted on 10 July 2016. The growth in the number of UCIs distributed in Belgium during 2017 can be attributed to net new cash and to positive market effects on the underlying assets of the UCIs. As compared to the period from 2004 to 2013, when the Belgian UCI sector registered very volatile net sales with an average annual net redemption of €0.15 billion, the period from 2014 to 2017 was a period of strong recovery driven by net inflows. a third trend concerns the increased compliance and enforcement risks. Belgium has recently introduced a class action that may in certain events apply to fund mis-selling. Furthermore, since the end of 2013, increased civil sanctions (including a number of automatic nullities) apply in cases of violation of fund regulations. The Law of 4 April 2014 on insurances (Insurance Law), which entered into force on 1 November 2014, is a partial transposition of Directive 2009/138/EC on the taking-up and pursuit of the business of insurance and reinsurance (Solvency II Directive), and consolidates the existing legislation with regard to the offering and conclusion of insurance contracts, insurance mediation and distribution, and supervision. Moreover, the Insurance Law introduces a number of new provisions, while also further clarifying the division of supervisory competences between the FSMA and the National Bank of Belgium. The Insurance Law has introduced several new provisions with regard to investment funds that underlie unit-linked life insurances (branch 23). However, the Law of 18 April 2017, which contains various provisions on the economy, abolished Article 20 of the Insurance Law. In 2014, the legislature intended to set up a level playing field regarding the type of assets or reference values for similar products (e.g., public undertakings for collective investment and branch 23 life insurance). Owing to the recent entry into force of the Solvency II Directive, Article 20 of the Insurance Law could not be retained, as it applies to Belgian and EEA Member State undertakings, and the imposition of prudential rules falls under the jurisdiction of the insurer's home Member State. Since the Law of 19 April 2014 implemented the AIFMD into Belgian law, Belgian real estate investment trusts (REITs) (sicafis) are automatically considered to be alternative investment funds subject to the requirements of the AIFMD. As a result, they are in a potentially less competitive position than real estate companies in other countries (such as REITs in the UK, REIT-AGs in Germany, listed property investment companies in France and fiscal investment institutions in the Netherlands) where a case-by-case analysis as to the application of AIFMD tends to apply. The SIR/GVV regime targets operational real estate companies engaged in commercial activities, such as the construction, rebuilding, renovating, developing, acquiring, selling, managing and operating of real estate assets, while the sicafi/vastgoedbevak regime is reserved for companies possessing the characteristics of an AIF (investment undertakings that raise capital from investors with a view to investing the collected funds in accordance with a defined investment policy for the benefit of these investors). SIR/GVVs with a social purpose (which are subject to specific rules). the appointment and remuneration of directors and certain managers. The Royal Decree of 9 November 2016 created a new type of fund to facilitate real estate investments in Belgium and abroad: the specialised real estate investment fund (FIIS/GVBF). In contrast to the SIR/GVV form, which is based on a long-term strategy, FIIS/GVBFs are dedicated to short-term investments and have a limited term (10 years, with the option to extend for further five-year periods), they does not have to diversify their assets and they are not submitted to any restriction regarding their debt ratio). As it is a fund, an FIIS/GVBF is as such subject to the AIFMD provisions unless it can prevail itself of an exemption. Entities held by a single investor and other entities exempted under Article 2.3 of the AIFMD can opt for FIIS/GVBF status, although they do not qualify as AIFs. The FIIS/GVBF status is more flexible than the SIR/GVV status. It does not require a licence from the FSMA, but merely registration with the Federal Public Service Finance. FIIS/GVBFs can invest in all kinds of real estate assets, with limited exceptions (e.g., the minimum value of their real estate assets must exceed €10 million, and they cannot act as real estate developers). They must distribute at least 80 per cent of their net profits. From a tax point of view, the regime governing FIIS/GVBFs aims at being particularly attractive: opting for the FIIS/GVBF status triggers the payment of an 'exit tax' of 12.75 per cent (15 per cent as from 2020), and the tax regime for the remainder is identical to that applying to existing sicafis and SIR/GVVs (see Section VII). This brief description provides an overview of the main principles of the current tax treatment of asset management funds in Belgium, without unravelling the many technical details and exemptions that this tax regime entails. The Belgian tax treatment of asset management funds and their investments largely depends on the manner the investment vehicle is structured: as a collective investment fund without legal personality holding its assets on a contractual basis (contractual fund); a regulated collective investment company with separate legal personality (regulated investment company); or a Belgian company not qualifying as a regulated investment company (holding company). Contractual funds are in principle considered to be tax-transparent, and are thus not subject to corporate income tax in Belgium. For tax purposes, the income received by a contractual fund is as a rule considered to be received directly by investors. However, an annual subscription tax on the net outstanding assets of a contractual fund in Belgium will be due from the management company as from the year following registration with the FSMA. The tax rate currently equals 0.0925 per cent, and is decreased to 0.01 per cent with respect to compartments or classes that exclusively attract financing from institutional and professional investors acting for their own account. A 'semi-transparent' tax regime is applicable to certain regulated investment companies, being, inter alia, open-ended and closed-ended investment companies that have a public or institutional character (as defined in the AIFMD Law), the SIR/GVV and the FIIS/GVBF (see Section V.ii). Such regulated investment companies are formally subject to ordinary corporate income tax, but their tax base is substantially reduced, and is limited to certain non-deductible business expenses (not including write-downs and capital losses on shares) and received abnormal or gratuitous advantages. Payments made to regulated investment companies generally benefit from withholding tax exemptions in Belgium, and any Belgian withholding tax that would be deducted is creditable and refundable. As a consequence, such investment companies are, as a rule, not taxable in Belgium on income from or capital gains on their investments. An important exception to this rule is the 30 per cent withholding tax that may be due on Belgian source dividends,39 which constitutes an actual financial cost for the investment company, as this withholding tax is not creditable or refundable. Any source state withholding tax is not creditable or refundable in Belgium. However, from a Belgian perspective, regulated investment companies are considered to qualify as tax residents for the purposes of double taxation conventions, and should thus be eligible to benefit from potential exemptions or reductions from taxation in the source state (which is, however, not undisputed). Subscription tax is also applicable to regulated investment companies. All income received (including capital gains, dividends and interest) by holding companies is, in principle, subject to the general corporate income tax rate (29.58 per cent for accounting years starting from 1 January 2018; 25 per cent for accounting years starting from 1 January 2020). However, dividends may be entirely exempt if the conditions of the participation exemption are fulfilled.40 A capital gains exemption on shares is available, which is subject to the same conditions as the dividend received deduction. Holding companies are, however, not subject to subscription tax. Foreign investors investing in contractual funds are generally considered to have directly invested in the assets of the fund, and their tax position should, in general, be determined as if they held the assets without the interposition of the fund. Dividends paid by the fund or capital gains realised at the occasion of the sale of parts in the fund are as such in principle not taxable in Belgium (although conditions apply). Dividends paid by certain regulated investment companies to foreign investors are (subject to several conditions) exempt from Belgian withholding tax, except to the extent the payments come from Belgian real estate income or dividend payments received by a fund from Belgian companies. Capital gains realised on the shares of regulated investment companies by foreign investors are, as a rule, not taxable in Belgium. Dividends received by foreign investors from holding companies are, in principle, subject to the Belgian withholding tax rate of 30 per cent, unless an exception applies (e.g., participation exemption, reduction or exemption based on double taxation conventions). Capital gains realised by foreign investors do not (under normal circumstances) attract taxation in Belgium. A specific withholding tax exemption exists with respect to dividends paid by Belgian companies to non-resident pension funds. In all circumstances, derogating rules apply to funds whose asset portfolio consists directly or indirectly of at least 10 per cent of debt instruments owned by individuals. The applicable Belgian VAT rate on services provided by asset managers is 21 per cent. However, a particular exemption for the management of collective investment funds exists. The Belgian general anti-abuse rule allows the tax authorities to disregard a legal act or series of legal acts carrying out one and the same transaction, provided that the tax authorities demonstrate that 'tax abuse' is at issue, which means (in general terms) that the taxpayer is acting in contradiction to the objectives of a certain tax rule. Additionally, a specific anti-abuse provision exists that restricts the application of the (100 per cent) dividend received deduction and the Belgian dividend withholding tax exemption in the case of a legal act or series of legal acts that are shown to be artificial and entered into primarily to obtain the Belgian dividend received deduction, the Belgian withholding tax exemption or any advantage based on the Parent–Subsidiary Directive in another EU Member State. Payments that are made directly or indirectly by Belgian companies above a cumulative threshold of €100,000 to non-cooperative jurisdictions and tax havens must be mentioned on a separate form that is joined to the payer's corporate income tax declaration. The deduction of such payments from the taxable income of the payer is, in principle, refused if no such declaration is made or, even if a declaration is made, if the payer fails to demonstrate that such payments are framed within real and genuine transactions, and that the counterparty is not an artificial construction. 1 Tom Van Dyck, Valérie Simonart and Laurence Pinte are partners, Steven Peeters is counsel and Karolien Decoene is a senior attorney at Liedekerke Wolters Waelbroeck Kirkpatrick. 2 Royal Decree of 24 April 2014 approving a regulation of the FSMA banning the marketing of certain financial products to non-professional clients. 5 Part 2, Book 2 of the UCITS Law (Articles 6–115). 6 Part 2, Book 3 of the UCITS Law (Articles 148–159). 7 The obligation of pre-approval by the FSMA applies to publicly offered Belgian UCITS, as well as to foreign UCITS fulfilling the conditions of the UCITS Directive, of which the shares are publicly offered in Belgium. 8 Part 3, Book 2 of the UCITS Law (Articles 188–255). 9 Part 3, Book 3 of the UCITS Law (Articles 256–271). 10 Directive 2011/61/EU of 8 June 2011 on Alternative Investment Fund Managers. 11 Articles 1–9 of the AIFMD Law. 12 When determining whether 'marketing in Belgium' takes place, it is of no significance whether the AIF belongs to the open-ended or closed-ended type; or whether the AIF is constituted under the law of contract, under trust law, under statute or has any other legal form. 13 This is irrespective of whether such AIFs are authorised or registered in an EU Member State or not. 14 The AIFMD Law's use of the terms 'European Economic Area' and 'European Union' is not cohesive: Article 3, 22° of the AIFMD Law defines the manager of an EU AIFM as 'a manager of an AIF with its registered office in a member state of the European Economic Area'. 15 Articles 10–112 of the AIFMD Law. 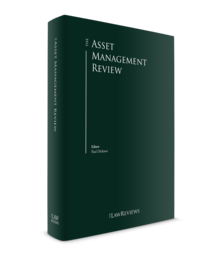 16 Articles 114–133 of the AIFMD Law. 17 Articles 134–165 of the AIFMD Law. In accordance with Article 493 AIFMD Law, Articles 134–165 will only enter into force on the date determined in the European Commission's delegated act adopted by the European Commission pursuant to Article 67(6) of the AIFMD. Until the date of entry into force, the system of private placements provided in Articles 497–499 AIFMD Law applies. With regard to public offerings, the provisions of Articles 503 and 504 AIFMD Law apply. 18 AIFMs managing AIFs with total assets under their management of a value of less than €100 million; or AIFMs managing AIFs with total assets under their management of a value of less than €500 million (if the AIF portfolios are unlevered and no redemption rights exist during a period of five years following the date of initial investment in each AIF). 19 Part III, Book 1 of the AIFMD Law (Articles 180–280). 20 AIFs raising capital solely from eligible investors acting on their own behalf and whose securities may only be acquired by such investors. 22 Part III, Book 2 of the AIFMD Law (Articles 281–305). 23 Article 3, 27° of the AIFMD Law. 24 Article 5, Section 1. 25 As such, the passport provided in Part II of the AIFMD Law does not apply to AIFs whose shares are publicly offered in Belgium. 26 In accordance with Article 183 AIFMD Law, the admitted categories of investments are financial instruments and liquid assets; options and forwards, currencies and exchange index contracts; real estate; high-risk capital; financial instruments issued by non-listed companies; and any other permitted categories of investment (as specified in the relevant Royal Decree). 27 The following documents must be distributed: the prospectus; the KIID; the annual and semi-annual reports; the fund rules or instruments of incorporation; and all communications and notifications to the shareholders. 28 FSMA Circular 2013–04 of 14 February 2013 relating to the notification procedure for undertakings for collective investment governed by Belgian law and fulfilling the conditions of Directive 2009/65/EU. 29 FSMA Circular 2013–05 of 14 February 2013 relating to the notification procedure for undertakings for collective investment governed by the law of another Member State of the European Economic Area and fulfilling the conditions of Directive 2009/65/EU. 30 Belgian Asset Managers Association (BEAMA) Annual Report 2017, 2. 31 BEAMA Annual Report 2017, 2. 32 BEAMA Annual Report 2017, 12. 33 BEAMA Annual Report 2017, 10. 34 Article 19 of the Insurance Law. 35 Article. 2 29° of the Law of 2 August 2002 on the supervision of the financial sector and on financial services (MiFID Law). 36 Article 20 of the Insurance Law. 37 All sicafis/vastgoedbevaks that existed before the introduction entry into force of the SIR/GVV Law have opted to apply the SIR/GVV status. 38 In accordance with Article 2, 6° of the Law of 19 April 2014, the activity of 'making real estate assets at the disposal of its users' is defined as 'the granting of rights by the SIR/GVV to the user of an immovable good, in accordance with a lease-, or superficies agreement, usufruct, or in accordance with any other agreement granting a right of use or occupation'. 39 If no dividend withholding tax exemption applies. A dividend withholding tax exemption is available in cases where the investment company has a 10 per cent shareholding in a Belgian company for a period of at least one year. 40 More flexible conditions apply to certain non-regulated investment companies.